High-quality filming and display of hands during cooking for smooth, easy-to-understand skills mastery. "Elements such as fine knife movements and subtle seasonings can now be shown clearly" said Keiji Minakami, Chinese Cuisine Instructor Koen Gakuen Ecole de Cuisine Patisserie. In the over 50 years since Koen Gakuen was established, its philosophy has been "light and salt", the two characters in "Koen", with history, traditions and culture that are rooted in the climate of Hokkaido. 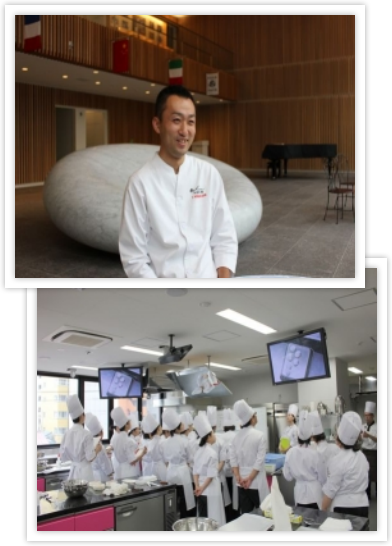 In addition to equipping its students with excellent insight and specialist knowledge and technology, Koen Gakuen strives to enrich its students to produce members of society and families who are healthy in body and soul. A total of 16 AW-HE50HN and AW-HE60HN HD Integrated Cameras are used in five training kitchens. Four have been introduced in the Chinese food training kitchen on the fifth floor of the East Building and three each have been introduced in the confectionery training kitchen and Western food training kitchen on the fourth floor and the confectionery/bakery training kitchen on the fourth floor of the Main Building. Footage is mainly used for explanations in practical cooking classes. 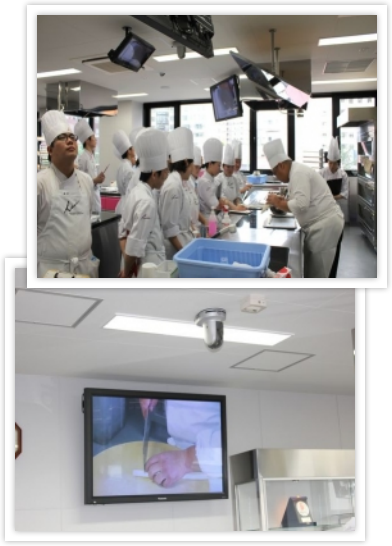 Showing cooking demonstrations and examples of food arrangement on a large-screen monitor is used in various situations in practical cooking lessons, and allow students at the back to clearly understand the handling demonstrated by the instructor. The system is also used in the school's open lobby and the restaurants in which students work as chefs. Dynamic, highquality footage is used as part of the unique, communityminded service provided by Koen Gakuen, with footage of lessons and the preparation of course meals in the restaurants transmitted to large-screen monitors in all of the buildings. With a 1/3 type Full-HD MOS and digital signal processor (DSP), the AW-HE50HN and AW-HE60HN have an 18x optical zoom lens and integrated pan-tilt mechanism, allowing smooth capture of the desired area, from an overall view of the demonstration area to a close-up of the instructor's hands. The cameras also have excellent color reproducibility, faithfully showing how food looks when it is cooked or how the colors change during cooking. In addition to the AW-RM50G wireless remote control, the cameras are controlled with iPod touch* which uniquely developed application software is installed. This app is designed to support the assistant instructor to operate cameras intuitively according to the movements of the instructor. Since AW-HE50HN and AW-HE60HN are IP compatible, it is easy to program camera control using mobile devices. Many aspects of cooking cannot be taught verbally, and it is extremely important for students to see it for themselves. For example, when filleting fish, students need to master fine adjustments such as the angle of the knife. However, it is difficult for students standing far away from the instructor to see the fine details of demonstrations. We had therefore already adopted methods for filming and displaying instructors' hands using cameras, but these cameras had poor image quality and were not easy to use. For example, a large controller had to be used for zooming, and the focus had to be adjusted manually. Additionally, only one camera was installed above the instructor. This meant that the instructor's head frequently blocked the view of their hands, and instructors had to constantly be aware of the camera while teaching. We therefore adopted a remote camera system from Panasonic when building our East Building. The first thing we noticed when we used it was that the footage was extremely high quality and clearly showed the color of the food. Elements such as fine knife movements, subtle seasoning and comparisons of the sizes of each food item could also be shown as they were by zooming. Multiple cameras are installed and the display can be easily switched to suit the situation, making it easy to show the instructor's hands at all times by changing the camera or angle of view. We are also pleased that the footage of the instructor's hands can be shown from the perspective of the instructor themselves. Previously, when instructors wanted to show a series of steps from cutting to boiling, they had to wait for the camera to move. Now instructors no longer need to be aware of the camera and pause their cooking. This allows smooth demonstrations, and we can see that the students' understanding is improving as a result. This camera system has greatly broadened our teaching possibilities.